Quick and simple configuration of the SafePoint Mistral can be carried out using a special PC configuration tool. 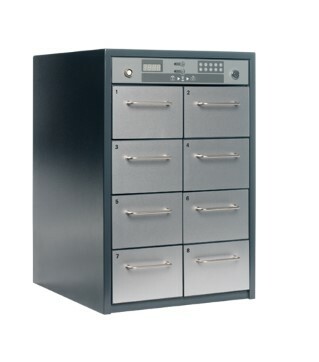 Choice of design: Up to eight drawers per unit or a combination of drawers and door modules. Any RAL colour can be chosen to paint the unit. 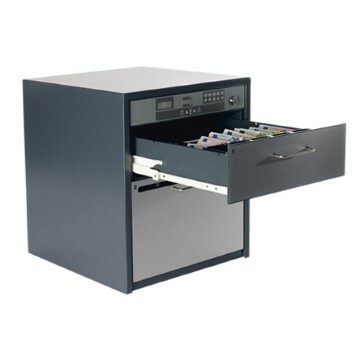 Optimised storage: Coin drawer, stationery drawer and security compartment. An optional security lid can also be added to conceal the contents of a full drawer. Fast key: Electronic fast key allows personalised access to SafePoint Mistral. Access rights for a fast key, such as quick access to certain drawers without time delay, are set via the unit configuration. Deposit: Coins, coin rolls, notes and note bundles. 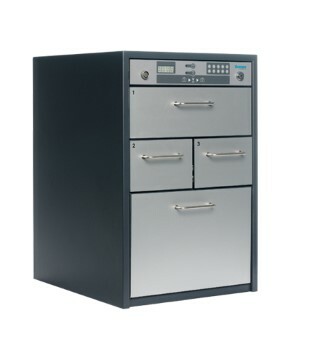 Deposit Method: Drawer with deposit flap or door with deposit slot.